Black is the new white, or possibly grey. We can’t boast 50 shades but we can be dark, brooding and mysterious with our range of kitchens available in these dramatic colour schemes. The Lucido and Image kitchens in black represent the height of modernity and feel very masculine and dramatic. High gloss finish, chrome and granite all add to the effect. The Avola kitchen in grey demonstrates that these darker kitchens can still have a degree of softness and can be practical in a family kitchen while still offer style and a wow factor. 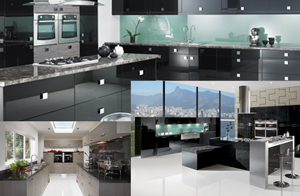 You can browse these and other Black & Grey kitchens in our Kitchens by Colour gallery. For help planning your kitchen why not book a consultation? 1 Response to "A closer look at our Kitchens by Colour: Black & Grey"